This notion that there is some sort of connection between wolves and the moon is so popular that you’ll hardly see the picture of a wolf or a book about wolves without the image of one of them howling at the full moon. So, when wolves howl is it any way directed to this important celestial body? It sounds quite fascinating and adds to the whole mysterious aura surrounding wolves. However, we’re going to have to disappoint you and say that there is no basis for this belief/assumption. It’s purely the result of coincidental and circumstantial events. Why Does It Appear Like Wolves Howl At The Moon? Wolves are typically nocturnal creatures, more active at night than during the day. And the moon comes out at night. As a wolf pack goes about at night whether to hunt, protect its territory, etc, each individual must howl to communicate with its fellows. Therefore, communication remains the main motivator for wolf howling. Members of a pack will howl for different lengths and pitches. While hunting, to ward of intruders, to locate one another, and even as a mating call. It may look like the animal is howling at the moon or in the direction of the moon but that’s coincidental. Even the experts and researchers agree. They further added that wolves point their faces toward the moon and stars while howling just because its better for acoustics. Taking that position projects the sound better upward and allows the sound to carry farther. Note that howls are the result of vibrations of a wolf’s vocal cords. Variables like the length of the vocal cords and the shape of the vocal tract can produce a stronger and clearer sound. So tilting their heads up helps to stretch out those cords. The whole wolf howling at the moon rumor appears to have started long before what we would regard as modern civilization. And although it’s a widely held belief, all fingers still point to Native American art and mythology as the source. 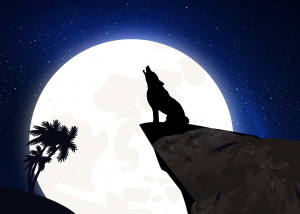 One of the Native American tribes, the Seneca, believe that it was a wolf that sung the moon into existence. There are even several references to the moon and wolves in ancient civilizations. It’s common to find images, literature and even engravings linking wolves and the moon. Many of the “gods” kept the company of wolves and interestingly, some of these gods were moon gods. Take for example, Hecate, the Greek goddess of the magic and the moon. She had dogs with her that could see in three directions at once. Another one was Diana, the Roman goddess of the moon and the hunt. Norse mythology tells of the wolf brothers Skoll and Hati; one to chase the sun and the other the moon with hopes of devouring it. Their activities also summon the day and night upon the Earth. Ultimately, if a wolf needs to howl it will do so, regardless of the presence of the full moon or not.